The Pioneers captured their first win of the season in a 42-0 route of Wyandotte. With the win, Leavenworth kept their playoff hopes alive. The Firebirds won't be favored in their next two games, so it was important that they were able to claim a victory against Olathe Northwest in the opening round of district play. If they can pull an upset in week eight or nine they'll have a good shot at the playoffs. 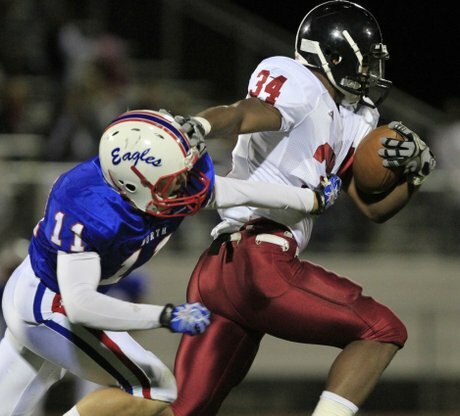 After taking down Olathe North on Friday, Lawrence pushed their own record to 5-2. The five wins are more than Lawrence had accumulated throughout 2009 and 2010 combined (4) and the team looks like they're peaking at the right time. After losing by more than 13 points in week one, the Falcons will be in a dogfight to make the playoffs. First off, they'll have to win out against Blue Valley West and Olathe East. On top of that, the point system will have to work in their favor which is always a tricky matter. It's not often that Olathe North loses a game, let alone two in a row. The Eagles have come out flat in the past few games and it's not the way you want to be playing at this juncture of the season. There was perhaps no game that the Ravens could have used quarterback Dalton Rook in as much as their game last Friday against Free State. Olathe Northwest looked out of sync on offense and ultimately lost, virtually eliminating themselves from playoff contention. Jason Randall, Leavenworth: Granted, Randall's efforts came against a pretty bad Wyandotte team, but he's been a solid player for the Pioneers all year and his efforts finally shown through. Randall toted the rock 11 times for 189 yards and three rushing touchdowns, on top of a 37-yard pass reception touchdown. Brad Strauss, Lawrence: Strauss had his way with the Olathe North defense the way no individual player has since Wichita Height's Dreamius Smith torched the Eagles last November in the 6A state championship game. Strauss passed for 194 yards and three touchdowns, on top of rushing for 50 yards and one score. 1. Olathe East (6-1): The Hawks have the longest winning streak in the Sunflower League at six games, but they may face their stiffest test of October this week when they face former Olathe East assistant coach Mike Zegunis and BV Northwest. 2. Lawrence (5-2): The Chesty Lions will be favored to close out the season with two more wins... and a 9-2 mark would be the school's best regular season record since 2005. 3. Olathe South (6-1): Call it the Olathe North hangover effect or maybe BV Northwest is just really underrated, but the Falcons are suddenly in a must win situation to make the playoffs. 4. Olathe North (5-2): This is the lowest Olathe North has ever slipped in the three year's of my weekly Power Rankings. The Eagles are as good as anyone, they just need to get their run game going again in addition to playing better defense. 5. 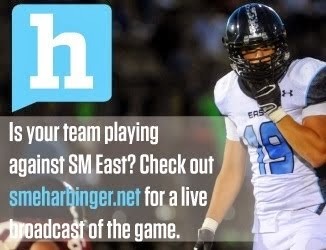 SM East (4-3): Former starting quarterback Dakota Collins appears to be back in uniform and starting after an ankle injury put him on the sidelines for the better half of the last five weeks. 6. Lawrence Free State (5-2): Free State pulled out another victory against Olathe Northwest, but that victory, like their other four, have come against teams ranked in the last five slots of the Power Rankings. Their efforts this week at home against Olathe North will really tell us about their actual ability. 7. SM West (4-3): Well Vikings, this is your chance to make up for your early season woes. A win in the heated Nut Cup rivalry game against SM East would all but secure a playoff berth for SM West. 8. Olathe Northwest (3-4): The Ravens are going to have to beat Lawrence and Olathe North in consecutive weeks to make the playoffs--that's a tall order. They might as well going crazy on the offensive side of the ball, because there's no sense in hold anything back now. 9. SM Northwest (2-5): The Cougars should be breathing a sigh of relief after escaping with a win in overtime against SM North. They should win their next two games, but it's hard to expect much after that in the playoffs. 10. SM North (1-6): When SM North gets the ball in the hands of their top playmaker, Mason Perez, good things tend to happen. He should be the focal point of their offense in these last two regular season weeks of play. 11. SM South (1-6): SM South can keep their playoff hopes alive with a win against BV North, and it would really help them if they could win by more than 13 points. 12. Leavenworth (1-6): Maybe the Wyandotte game was what Leavenworth needed to start clicking? We'll find out when they play SM Northwest this week. Blue Valley Northwest Played a near perfect game offensively. That they did, SouthSide. No offense to Brad Straus or Kyle Zimmerman, but I have never seen a QB this year as good as Fugate played. Had his receivers pulled down some of his throws against BV 2 weeks ago, BV would be sitting with one loss right now too. The receivers did NOT have that problem vs. South. Having seen both games, it wasn't a matter of coverage, the rec. dropped wide open passes against BV and caught passes with decent coverage against OS. Watching them the past 2 weeks, barring bad weather, BVNW will walk through the rest of the district. PS I told about that EKL! (j/k fellas, don't get excited).